Earth has been invaded by the Boov. A race of short, fearful, but technologically advanced aliens have fled far across the galaxy away from their ever-pursuing enemy, the Gorg. Under the guidance of their leader, Smek, the Boov have claimed Earth as their new home, and have relocated all humans to “Happy Humanstown,” a fenced-in area of Australia. Well – they’ve relocated almost all of the humans. They missed one. Tip, a school-aged girl, is distraught to find that her mother is missing. At the same time, one of the Boov, a lonely outcast named Oh, finds himself in trouble when he accidentally reveals the location of the new Boov homeworld to the Gorg. While on the run from the other Boov, Oh is captured by Tip. Together, they realize that by combining forces, they could both meet their goals – Oh can escape the angry Boov, and Tip can find her mom. Oh and Tip both find themselves feeling alone. Oh, because he doesn’t have any friends, and Tip, because her mom has been taken away from her. Children touched by adoption could relate powerfully to either of these characters’ feelings. This movie also touches on adoption in an unexpected way, which is only revealed late in the film. 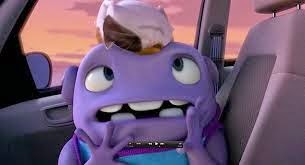 It’s a big spoiler… Near the end of the film we learn that the Gorg are pursuing the Boov because the Boov captain has stolen an egg containing every single Gorg baby. When the babies are returned to the Gorg, they leave peacefully. Tip learns to be friends with someone that she previously viewed as an enemy. Much like Annie in this Christmas’ remake of the musical, Tip is perpetually optimistic that she will find her mom. She is strong and courageous. 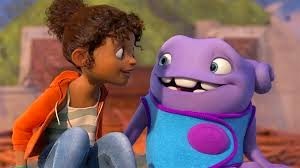 *Spoiler alert* Unlike Annie, Tip does reunify with her mom, and it’s a very happy moment in the film. Some kids might find it very sad when Oh invites a party and no one comes. 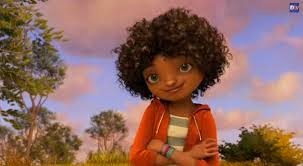 Tip’s desire to find her mother is very strong, and she acknowledges her anger at the fact that she’s alone, even expressing that, because she’s a kid, she shouldn’t be on her own. Some kids might find it helpful to have this expressed, while others might find it striking a sad chord with them. Tip initially identifies Oh with the rest of the Boov, and yells at him, “It’s all your fault. You stole my mom!” I can imagine, at some times, that some adopted people want to yell this at someone – their adoptive parents, social workers, or the state. It might resonate with some young viewers. Later, when Oh tries to leave Tip, she confronts him, “You promised to help me find my mom.” His reply could be very hard for kids who have experienced disappointment or betrayal. He says, “I un-promise.” Oh eventually changes his mind, but the moment could be distressing for some. Upon their reunion, Tip tells her mother, “I would never have stopped looking until I found you.” I wish that that line had been spoken by her mother instead of her; kids don’t need that responsibility – especially kids who have been separated from their parents, who might be prone to mistakenly believe that the separation is their fault. Some characters seem to be in peril, and for a brief moment, it looks like one of the main characters has died. 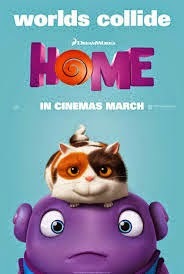 Home is a fun film about a strong young girl and an unlikely friend. The plot centers around a child searching for her stolen parent and (spoiler alert) a parent searching for his stolen babies. It’s possible that these plot aspects could make the film too difficult for some young viewers, and parents should use their discretion to decide whether their kids might be impacted in that way. Otherwise, this is probably a good choice for kids ages 9-12 or so. be alone? Have you ever felt alone? Why were the Gorg chasing the Boov?